BIGGER IS BETTER! Back by popular demand, local Sinatra favorite Jonathan Poretz returns to the Lesher with his full, 12-piece, Swingin' Night Orchestra BIG BAND! Songs include "My Way," "New York New York," "Luck Be A Lady," “That’s Life,” "Fly Me To The Moon," "I've Got You Under My Skin," "Mack The Knife," "That's Amore," and many more! Nobody delivered a song like Frank Sinatra, and Las Vegas-style entertainer Jonathan Poretz delivers them all with pizzazz and style backed by a powerhouse 9-horn Basie-Style Big Band. This show features many of the great hits of Frank Sinatra and a salute to the other legendary singers who made Las Vegas the entertainment capitol of the world. 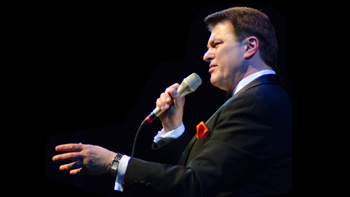 Poretz has entertained audiences worldwide with his stylistic interpretations from the Great American Songbook. He has appeared in Broadway-style production shows such as "The Rat Pack Is Back" in Las Vegas and other major cities, and has headlined some of the top jazz venues around the country.